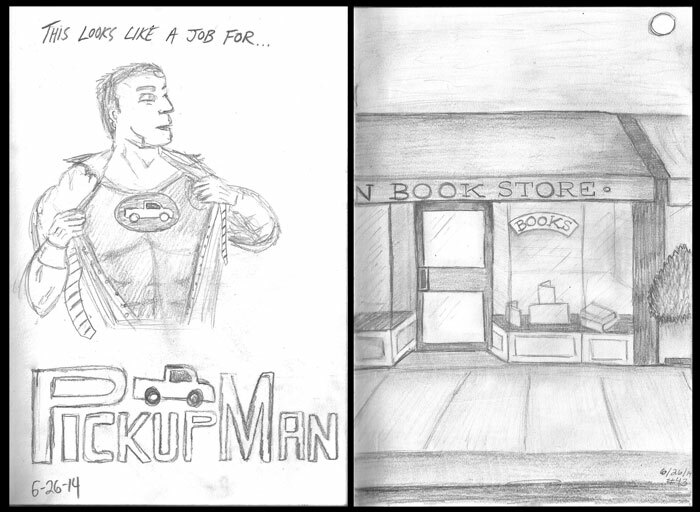 Day 43: Sean loves to make fun of a character in one of Stef’s favorite shows, Kyle XY, by calling him PickupMan. Stef draws a nice bookstore storefront after a pleasant trip to Princeton earlier that day. Day 44: OOMPH. Today was a rough day for Stef. After a long day of working, the only thing to brighten up her day was a big warm cookie Sunday from a classy restaurant they went to that night. 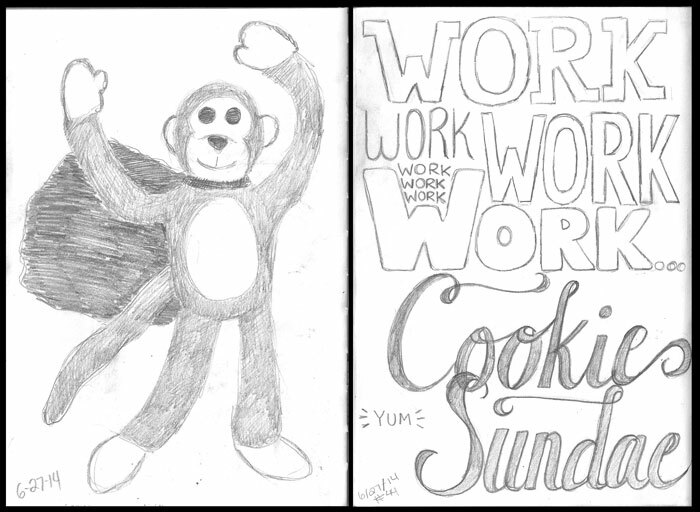 Sean keeps things lighthearted and fun with a sketch of a flying monkey toy. Day 45: Woah. Mario sure let himself go…Sean sketches an overweight Mario reaching for the flag at the end of a level in Super Mario Brothers. 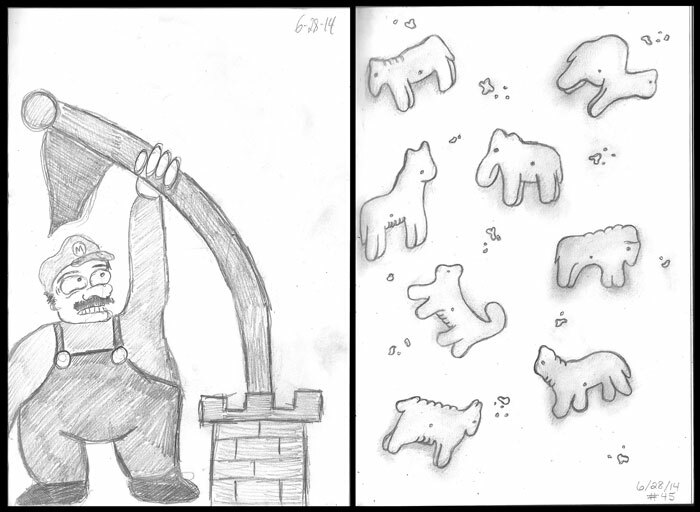 Stef keeps the sketch simple for the day with just a few animal crackers. Can you guess what all the animals are? 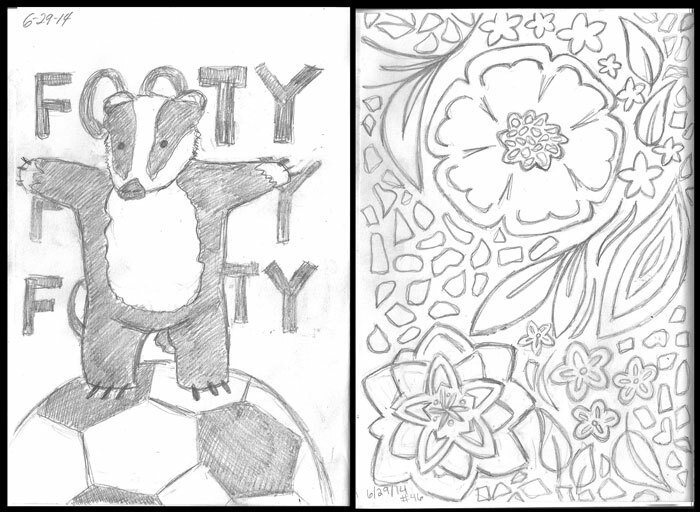 Day 46: Sean got swept up in the World Cup today, so he sketched a soccer playing badger from an old favorite internet video of his. Stef finds inspiration in a pattern on her sister’s lunchbox. Day 47: After reading a book about one of his favorite albums of all time, Sean hand letters a lyric from a song by Neutral Milk Hotel. 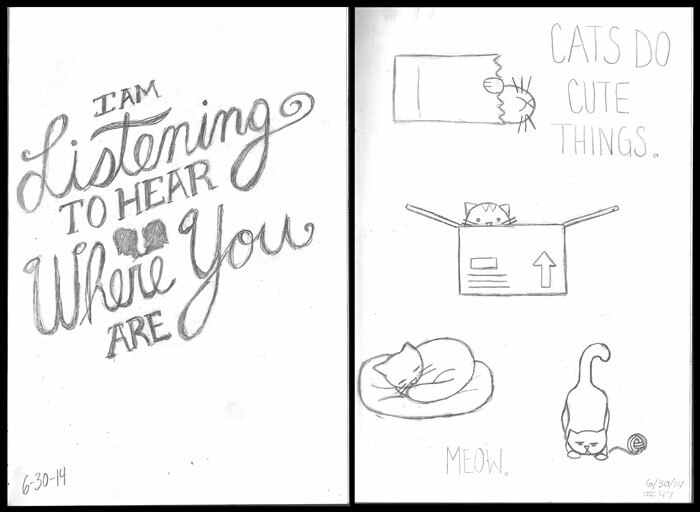 Stef, on the other hand, makes up a sketch that she missed by quickly drawing a few cute things that cats do. Day 48: Stef fills her sketch for the day with coffee beans and some typography after yet another looooong day at work. 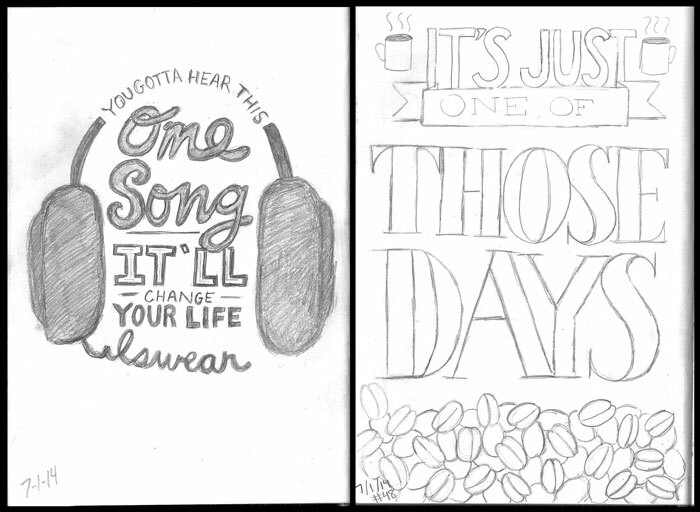 Sean finds inspiration in the movie Garden State and creates some awesome typography of a famous line in the film. Day 49: ***Theme: CANDY! 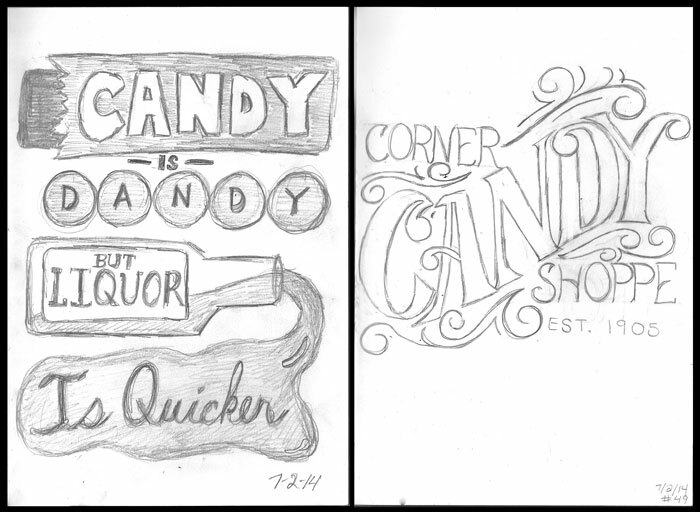 *** Sean gives us both typography and imagery with a quote from a great old classic, Willy Wonka and the Chocolate Factory, while Stef takes the opportunity to create a possible logo for a fictional candy shoppe brand that she will soon use for a portfolio project next semester. And there you go! Another week down. This one was tough, but we pulled through. Strangely though, I don’t think we struggled with coming up with ideas of what to draw, as we had done a lot in the past. So there’s improvement there. Next week, we’re hoping to get back on the track and put down some awesome sketches for next week.